The space, called Nowadays, opened in mid-June. “It’s been our best opportunity to design with weeds,” Seiter says. The idea of designing with weeds is gaining adherents among landscape architects as they pay more attention to native species in plantings that require fewer resources to establish and maintain. It’s an approach favored and popularized by Peter Del Tredici, an associate professor of landscape architecture at the Harvard Graduate School of Design, through his book Wild Urban Plants of the Northeast: A Field Guide. For a 400-unit residential and retail project under construction in Washington, D.C., called the Atlantic Plumbing Residences, Future Green Studio indexed the plants that were naturally occurring on the two-parcel site, including red mulberry bushes, peach trees, Boston ivy, and multiple species of vines. Weed species were eventually taken out of plans for the long window boxes on the building’s western facade, but the final planting palette includes four of the vine species that were growing wild on the preexisting structure—Virginia creeper (Parthenocissus quinquefolia), Boston ivy (Parthenocissus tricuspidata), trumpet creeper (Campsis radicans), and English ivy (Hedera helix). Another completed residential project, designed by the architects DDG in New York City’s Meatpacking District, took inspiration from the spontaneous plants growing atop the canopies of old loading docks. Seiter says some of the species used in the project’s garden and entrance canopy are local crossovers—both native and weed—including staghorn sumac, goldenrod, aster, purple love grass, and milkweed. 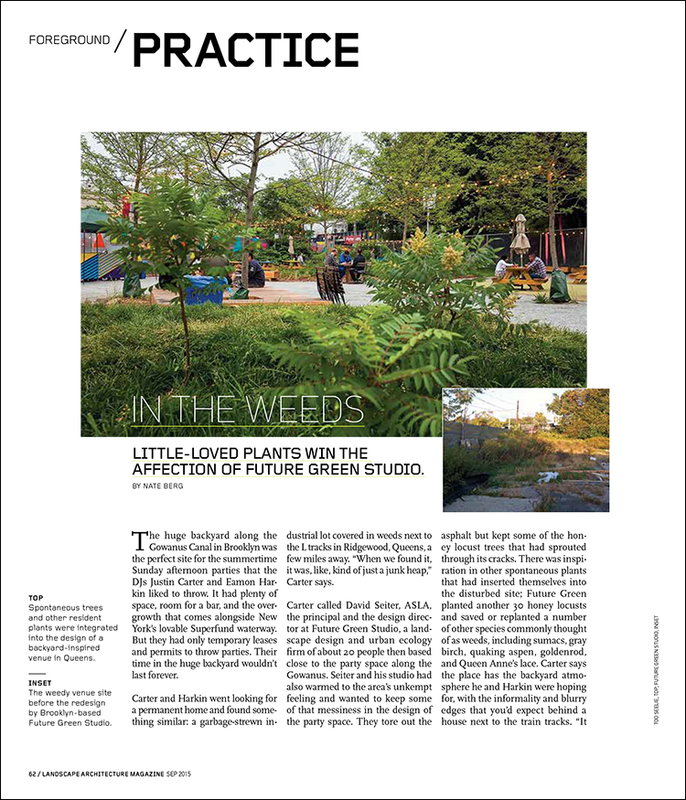 In addition to this design work, Future Green Studio has also taken on an informal advocacy role, making the case for using weeds in design, but also for appreciating the role they play in urban nature. Seiter and his team started a project they call “Spontaneous Urban Plants,” to celebrate the benefits, ubiquity, and beauty of weeds. They have been photographing and cataloging weed species and writing up profiles of their ecological roles, environmental benefits, cultural histories, and culinary uses. They’ve also mapped species around their old offices near the Gowanus Canal and their new offices not far away in Red Hook, sharing geotagged images on Instagram (hashtag: #spontaneousurbanplants). Others in New York and elsewhere are submitting photos of various species that wind up utility poles or peek out of storm drains. “I’ve got my mom on Instagram, hashtagging weeds,” Seiter says. Future Green Studio’s early efforts at weed appreciation took place on sidewalks right outside its office doors. Using bright yellow paint, the studio literally highlighted dominant urban weed species by painting circles around them where they grow in the cracks of the pavement or jut out from the crannies of a brick wall. They uprooted other plants and photographed them, creating plant profiles that mimic the style of botanical illustrations. The plant profiles call out some of the ways these species serve the urban environment. The summer annual Chenopodium album, for instance, also known as lamb’s-quarter, is a spindly plant with spade-shaped leaves that shoots straight up out of the sidewalk cracks; it grows in many disturbed sites and can perform phytoremediation on soils, drawing out heavy metals such as zinc, copper, and lead. Taraxacum officinale, the dandelion, is adept at surviving in disturbed soils and can serve as a food source for both wildlife and humans. Its young leaves are rich in vitamins and minerals, and tea made from its roots has been used for centuries to treat ailments of the liver and urinary tract. Seiter thinks these plants make up an under-recognized part of the broader urban ecosystem, cleaning soils and playing a role in erosion control, providing habitats and food sources, and helping to manage and clean stormwater. “We’re seeing, potentially, a shift away from landscape urbanism, which is treating these large-scale sites and postindustrial sites in a way that’s more grandiose, and perhaps a shift toward a kind of micro landscape urbanism, where you’re doing the small sites and the traditionally underutilized spaces of the roofs and the walls and the sidewalks,” he says. Del Tredici argues that landscape architects should be more open to the idea of designing with weed species and spontaneously occurring vegetation, and taking advantage of the inherent ecological services they can provide. But, Del Tredici says, more landscape architects are coming around, however slowly, to this idea of ceding control to these ecological forces. Plant suppliers are responding to these changing preferences by increasing their stocks of native species, including some plants more typically considered weeds. In Staten Island, the Greenbelt Native Plant Center is one of those forward-thinking nurseries. It’s run by the city’s parks department, and though it does not sell plants to contractors or private projects, it does supply native plants for projects built on public land in the city, as well as to many community groups. Jeremy LaPointe, the nursery’s manager, says he’s seeing a rising interest in landscapes with native species and plants commonly considered weeds, but it’s a slow transition. LaPointe notes that this type of weedier approach is being embraced by the National Park Service, the U.S. Forest Service, and the Bureau of Land Management, all of which are using native species on a large scale to improve ecosystem health. He says it’s only a matter of time before designers and landscape architects take that approach on smaller-scale projects. Nate Berg is a writer based in Los Angeles who covers cities, technology, and design. These plants are largely already being widely used by Landscape Architects as “natives”. I feel that calling them “weeds” decreases their appeal and simply assigns an unappealing terminology to natives that are used and appreciated already. Queen Ann’s Lace is an invasive European plant that has naturalized (causing many to believe it to be native to the USA).